On July 12, 1926 the inaugural meeting took place on the S.S. Innisfallen by invitation of Robert Sinnott. The founding members were J.J. Horgan, President, R.W. Sinnott, Vice President, J.J. Gowan, Honorary Treasurer and P.I. Barry, Honorary Secretary. The Charter was presented by Walter Malcolm - Past President Belfast. The Berwick Fountain on Grand Parade, Cork, was built in 1860 and presented to the city by Judge berwick who had been chairman of the Quarter Sessions in Cork for over twelve years. It was intended to comprise a jet throwing water to a considerable height at a cost of 150 Pounds. This function had been neglected by 1976 and barely performed at that point. The Rotary Club, with Geoffrey Thompson as president, decided that in order to mark the fiftieth anniversary of the Foundation of the Club in Cork they would contribute the necessary funds for the restoration work at the Club's expense. Substantial money was raised and this work was duly carried out. In March 1976 the Lord Mayor, Alderman A.A. Healy recorded the appreciation of the Citizens of the Civic spirit of the members of the Club who contributed so generously to the restoration of the Berwick Fountain. 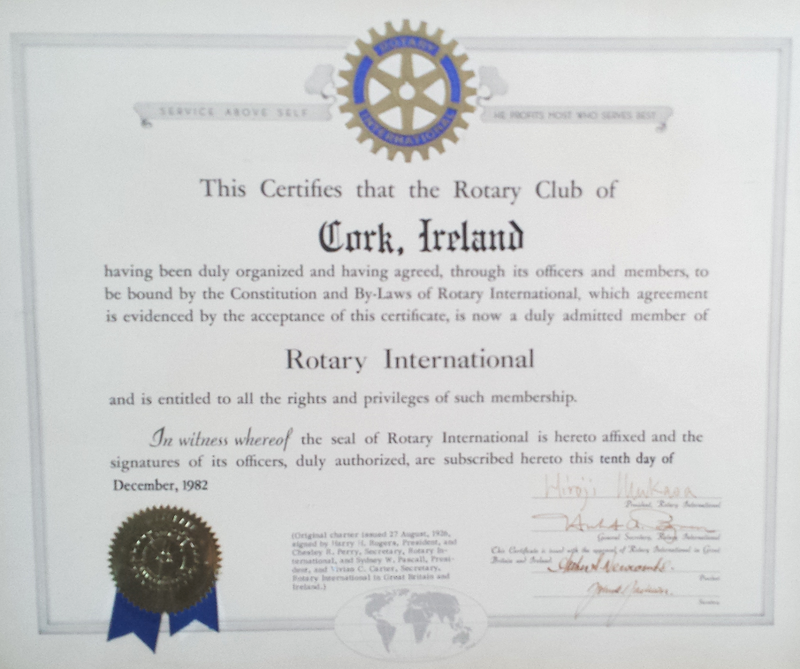 In 1983 the Club planted over 500 trees in conjunction with Cork Rotaract Club as art of the Rotary Environmental project. Also in 1983 the Rotary Foundation Scholarship sponsored two students to attend U.C.C.. In 1984 the Club sponsored a "Garden for the Blind." The Club raised 8,900 pounds for the "Polio Plus" Rotary International Campaign. This represented the highest figure of all clubs in the Republic. On December 8, 1989 the Club launched our first ever sheltered shopping project. In 1994 our very successful "Kids Out" project was started. This is a very special day in the Rotary Calendar. The concept is to combine children with special needs and caring adults to have a memorable day of fun. This was the first "Kids Out" in the Republic of Ireland. A few years later(1998/1999) our club moved Received and accepted proposals from women for the first time. It was also the time that the Sheltered Shopping reception was moved to the city hall for our biggest event of the year, with the help of the Lord Mayor and Cork Corporation who provided the magnificent facilities free of charge. In the year 2000 we hosted a Corporate Quiz in aid of St. Vincent de Paul at the Imperial Hotel in Cork. We accomplished our goal of raising enough money to purchase a service van for St. Vincent de Paul to carry out repairs to people's houses, mainly those who are elderly and living alone. In 2001 there was another highly successful "Kids Out" day.